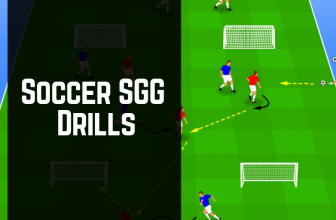 Small Sided Games (or SSG for short) are not only a great way to end your practices with a competitive edge but it also allows you to re-enforce any coaching that has gone on in the previous drills within that particular training practice. So, let’s take a 2v2 defending scenario as an example. This was your topic of focus for a particular training practice. This is where you can setup a small sided game to specifically focus on the topic you’ve been hammering home for the past hour. For the 2v2 example, you might decide to setup an SSG that involves or 2v2 or 4v4. By this point in the practice, you’re playing should be getting to grips with their new-found knowledge and it is your job to sit back and observe – only interrupting to coach the very important parts they may have missed. …In short, this is the time to let your players play. 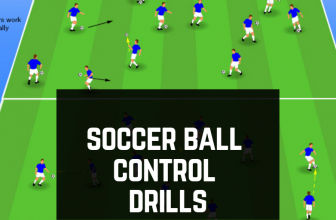 Again, as each drill will focus on a different topic – the specific key points will change from session to session. You may even use the exact same setup as you did before but with a different focus. So for that reason, there aren’t any general key coaching to highlight. 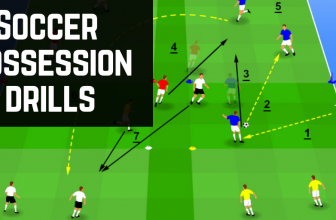 SoccerTutor.com has a great pieces of software that works brilliantly for creating your own portfolio of Small Sided Games. In-fact they have a whole of of additional SSG’s your can grab from their website. You can check out the software here. It’s a steal at the price it’s been listed at, so it’s worth checking out…. Each team is trying to keep possession of the ball and score in one of the 2 goals situated either end of the pitch. In this particular example, whites have a target player up top to aim for which replicates using a target forward to play off. Reds on the other hand have wingers to use. With these two scenarios each team has to play slightly differently; making different runs, passes and of course being aware of positional differences across the pitch. Remember to keep the intensity high and the game flowing with minimal breaks. Setup 4 small to medium sized goals with a goalkeeper on each side of the pitch. In two opposite corners place two neutral players. Finally, in the middle of the pitch split your remaining players into a 4v4 situation. The game starts with one of the keepers feeding the ball out to a team of their choice. For this example; yellows. On receiving the ball, yellows are now aiming to score in any of the 3 other goals while the blues are trying to win the ball to score past the starting keeper. Make sure you have enough balls in each net to keep the game running smoothly. Neutral players become members of whatever team is in possession. to Create a 4v3 or 5 v3 overload. Have each keeper work in a clockwise direction when feeding the ball out. Variation #2: Number code each goalkeeper. Call a number out and that keeper must release the ball into play. I wouldn’t let the outfield players know the number of the keeper. This means they have to be extra vigilant and aware of where the next ball is coming from. 3 Teams of 3 Players; One playing in defense, one playing in attack and one taking up a ready position at the opposite end to the goals. If the attacking team score they stay on as attacking team while defending team and resting team rotate. If attacking team do not score, they become the new defending team. 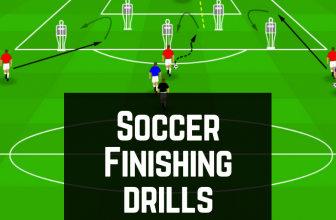 To setup this drill use a normal sized pitch for 5-aside. Instead of putting one goal either side of the field of play – place 2 goals facing away from the middle players on each end. Split your group into two teams. Place 1 striker from each team either end of the pitch and place the rest of your players in a 3v3 scenario in the middle of the pitch. The aim of this drill is to encourage your players to work the ball out to the forwards quickly to get a shot on goal. As the coach, you’ll need to have a few balls spare with you at all times to ensure you keep the intensity high and the game flowing with minimal breaks. This is a simple setup SSG that requires 2 smaller pitches big enough to accommodate a 3v3 on each side. Both games start at the same time but a player from each side on opposing teams share a number. There are 12 players so therefore the numbering will go from 1-6 (two players share the same number from opposite teams). This drill was originally posted as part of the Overload Practices Drills Guide you can check out here. 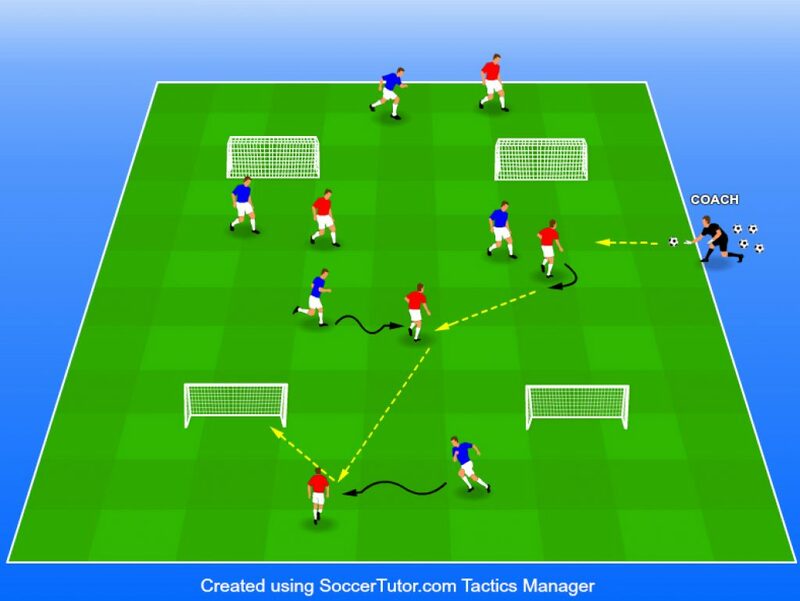 For this drill, whatever team is in possession will provide the additional player to creating an attacking overload in each area. The player to change zones to create the overload will the non-passing player. 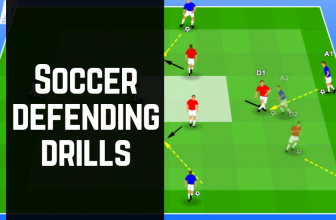 Variation #1: This drill can be switched on its head to create defending overloads instead of attacking overloads. This is an alternative drill setup to the Wingers vs Target Players drill we went into detail on above. For this version, setup a normal pitch with a 4v4 scenario plus goalkeepers. One side, place two target players for one team, and on the other side place 2 wingers in attacking positions. The ball must be played to at least one of these players before the team is able to take a shot on goal. For the other team, they will use wingers. Ensure your change teams roles. Variation #1: You could start with giving the wingers the full use of the pitch then progress to cornering them in attacking positions. This will change the dynamic of how the defending team will setup and mark their players. 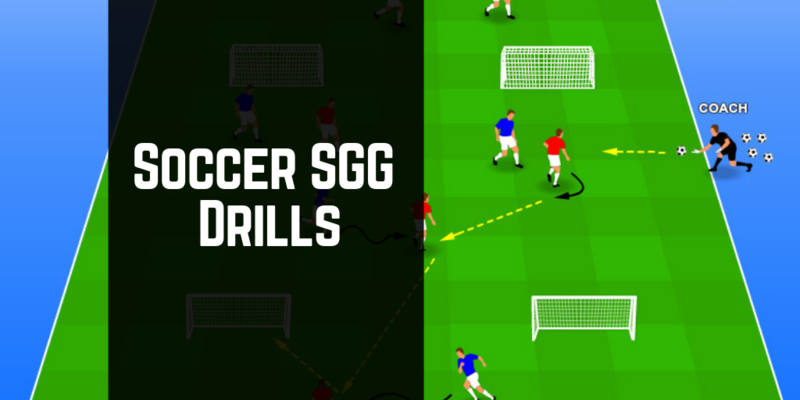 A really simple SSG game to end your practice with. Setup with 2 teams of 6 with 2 players from each team taking up a wide positions already marked out for them. Before each team can have a shot on goal they must work the ball out side for the wide player to cross the ball in to the attackers.